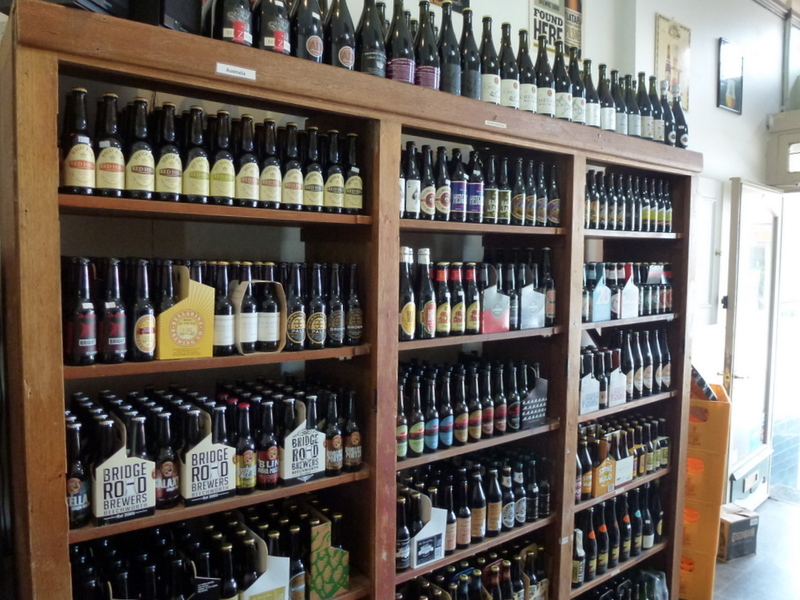 Now Melbourne is the beating heart of a beer renaissance in the country that has seen the number of craft and microbreweries, not to mention specialist beer outlets, exceed 200. While that was more than I could hope to experience in my ten days in Australia (mainly in Melbourne but also a couple of days in Sydney) I nonetheless had a fair opportunity to sample some of the new delights on offer. As it happened, my first exposure to Melbourne’s revitalised craft beer boom was also perhaps its most impressive expression. My good friend and former London drinking buddy Tim (who’d brought the bottles to the UK that were the subject of my previous Aussie beer) had kindly offered to put me up for the first few nights of my visit. 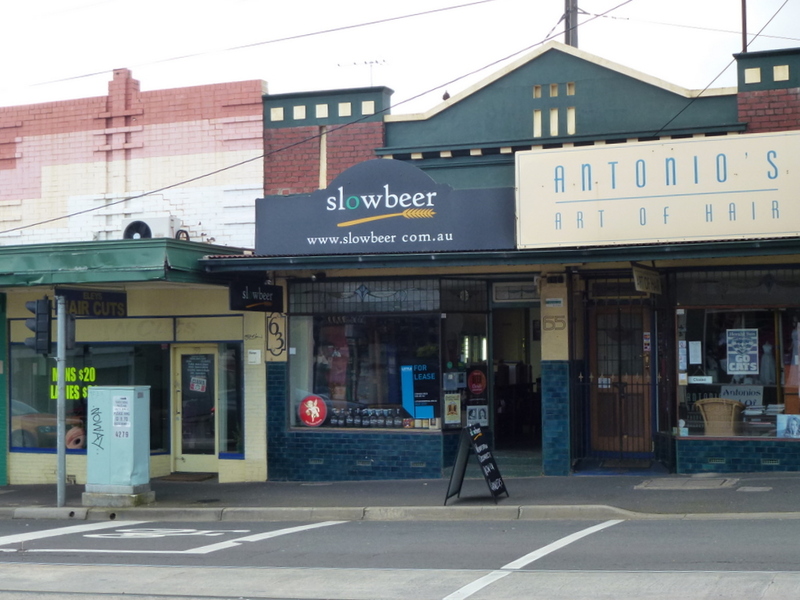 However, what Tim had neglected to tell me was that Hawthorn, the Melbourne neighbourhood where he and his lovely bride Marcella currently reside, is also the home of one of the finest specialist beer retailers in the country, Slowbeer. 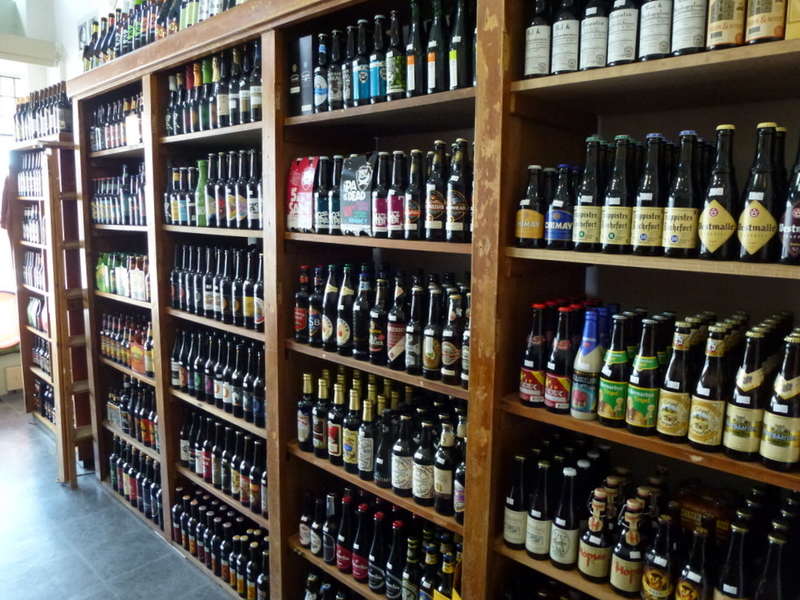 As will be clear from my snaps, this unprepossessing bottle shop – barely five minutes from Tim and Marcella’s place (lucky so and sos) – houses a fine selection of both local, national and international brews. The latter selection even includes two of Aberdeenshire beer radicalist BrewDog’s most extreme brews, Tactical Nuclear Penguin and Sink The Bismark. But I hadn’t travelled half way around the world to sample British brews, even ones as hard to acquire and as notorious as these (not that I could afford them anyway). 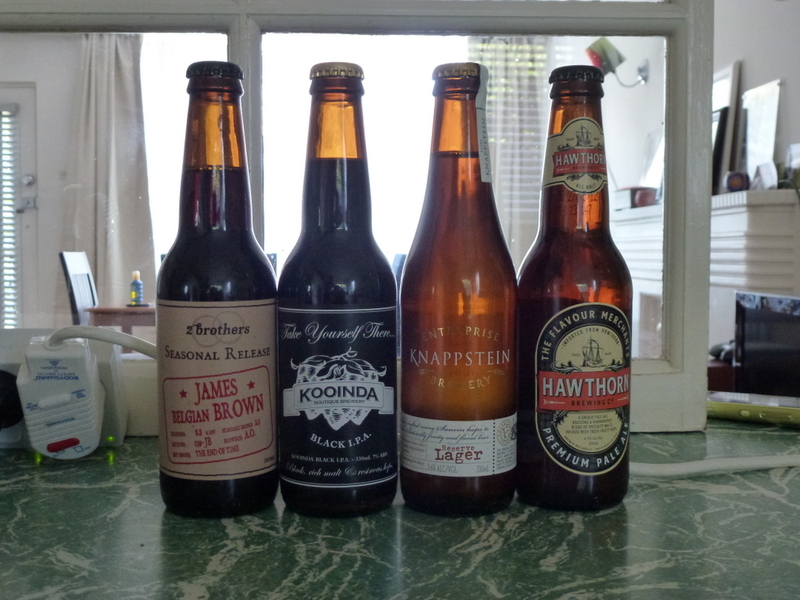 Instead, after much umming and ahhing, Tim and I settled on four Australian brews, three local, one from South Australia. Each was worthy of a wider audience and the final beer sampled was as good a brew as I’ve sampled in years. As ever, these were best sampled in order of increasing alcohol content. 1) Hawthorn Premium Pale Ale (4.7%): With a combination of British, American and New Zealand hops this orange to amber pale ale seems a bit unsure of its provenance, despite being a product of the most local brewery to Slowbeer itself. Quite drinkable, if not especially distinctive, with that slight caramel note that seems to run deep in Australian craft brewing. Not entirely unexpectedly, Hawthorn Brewing Co. is based in Hawthorn to the east of Melbourne’s central business district and just down the road from Slowbeer. 2) Knappstein Reserve Lager (5.6%): Described as a “premium Bavarian style lager”, Knappstein Reserve did indeed approximate the south German style. Pale straw to gold, with a nicely herbal, grassy and subtly fruity palate. The beer also offers that tell-tale yeastiness and that hints at the beer being unpasteurised (as regular readers will know, I’m a sucker for unpasteurised lagers). The expansive head only adds to the illusion. Very decent. Knappstein Enterprise Winery and Brewery in the Clare Valley in South Australia is, as the name suggests, primarily a wine maker and by all accounts a very good one. Its single beer is more than simply a sideline on this evidence, however. 3) Kooinda Black IPA (7%): The striking hoppiness, both on the nose and the palate, plus the tree-barky yeastiness helps make this beer taste so much like its namesake from south-east London’s Kernel Brewery that it’s almost surreal. As with other members of the species, the rich black colour and charcoal nose disguise a relatively light-bodied brew, even with its relatively high alcohol content. A perfectly well-made beer that’s maybe not quite to my (current) taste. Kooinda Black IPA is a product of the Kooinda Boutique Brewery/Happy Place Brewing Co. in Heidelberg West, seven miles or so north-northeast of Melbourne’s CBD. 4) 2 Brothers James (Belgian) Brown (8.8%): Tremendous Belgian-style dark brown ale which any low-countries’ brewer would be proud of. Intense rummy, dark sugar and roasted nutty flavours with good hop balance and not a trace of cloying sweetness. Banana esters pervade the palate and waft on the aroma. While reviews elsewhere have been mixed, this was probably my personal favourite beer sampled while down under. I can’t believe Tim and I simply struck lucky with our bottle. A tremendous effort. 2 Brothers Brewery is in Moorabbin, around 10 miles south east of Melbourne’s CBD. With this fine sample of Australian bottled beers in the bag it was time to venture out into the pubs and bars of this increasingly interesting and beer-friendly nation to further expand my alcoholic horizons. As I’ll hopefully convey, the experience was always affirmatory, frequently fascinating, occasionally obtuse but endlessly enjoyable. Only my wallet had reason to regret anything. Glad you enjoyed your visit, Tippster!